Choirs with Purpose is a collective of 12 singing groups for whom ‘music reaches beyond the everyday to share their messages of triumph over adversity’. The choirs include the Missing People Choir most recently seen on Britain’s Got Talent, the chart-topping NHS Choir of Greenwich and Lewisham, the UK Hospices Choir and more. What binds them all is they each have a powerful message to share. The twelve choirs from across the UK – some which were formed specially for the project by producer James Hawkins – have joined forces to produce a new compilation album ‘Stand Together’ for release Christmas 2017. Choirs With Purpose will also release one epic single that brings together all voices from all twelve choirs. 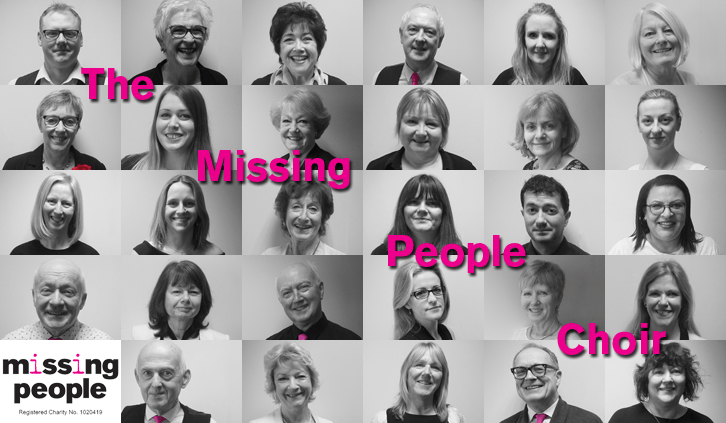 Made up of friends and families who have had someone they love go missing, The Missing People Choir sing alongside staff and supporters from the UK charity Missing People. The choir, formed in June 2014, is a partnership between the charity, Missing People which offers help and support when someone disappears, and James Hawkins Music, specialists in producing music with purpose. The choir will take the stage at Being the Story to share their message through music. Made up of friends and families who have had someone they love go missing, The Missing People Choir sing alongside staff and supporters from the UK charity Missing People. The choir, formed in June 2014, is a partnership between the charity, Missing People, which offers help and support when someone disappears, and James Hawkins Music, specialists in producing music with purpose. The choir will take the stage at Being the Story to share their message through music.